I am gonna have to have my nose to the grindstone for the next little while so hopefully that won't curtail going out too much. I did manage to pop out at lunchtime today to a show at the National Art Gallery. 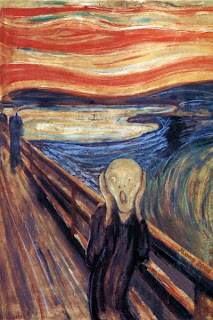 It's of Munch...you know, the guy who painted Scream? He's so famous, even I had heard of him. While the show was great, I can't say it was a pick-me-up. Buddy must've had some pretty serious issues going on in his head. I traipsed back to college (just 5 minutes away; TCD can't be beat for location) thoughtfully and a bit miserably. Just in the right mood, in fact, for some serious studying of 19th century literature. I've got to go to the gallery more often. While this was a paid show, the main collection is free to see and it's a lovely, quiet, contemplative space. I don't know a lot about art but I like the atmosphere. Didn't realise this was on. Must head over for a look. It's funny, you miss so much when you're living in a city. I am glad I slacked off work and Googled Dublin. I know! I think I go to much more stuff than anyone I know who's actually from here, because although it's been a few months now it's all still new and shiny for this chick from the sticks. Hope you like the show coz it was really great! Thank you for your kind words about my blog, I really appreciate it. You made me laugh :-) My mom and dad are coming to visit me in Dublin this year and I'll have to do a big tidy-up in my apartment before they get here, or that'll be the look on my dad's face (he's the neat freak in our family). The exhibition is on for ages, until early December some time. I don't remember the exact date, but it's on their website.